We have learnt a lot over the years!! Here are some handy hints for anyone attempting something similar! First and foremost- keep a journal!! It is great to keep a record of the changes, but also valuable information such as suppliers and contacts. It makes very interesting reading a few years later! If you can possibly afford it, get good equipment e.g. chainsaws and brush-cutter and (especially) a tractor with a bucket and implements early on, even to the point of taking a temporary loan, or if you are buying, a slightly larger mortgage to do so! It saves so much back breaking work, halves the time taken and often does a far better and longer lasting job! We used the van, tried a couple of old tractors without implements and often had more trouble trying to start the old Fordson Major than doing any productive work. Then a great old International, but it was like the Fordson, a real ‘beast’. Once we could afford a decent (though small) tractor, a great little Yanmar diesel, life was so much easier! Would have preferred a bucket with more ‘grunt’ though. 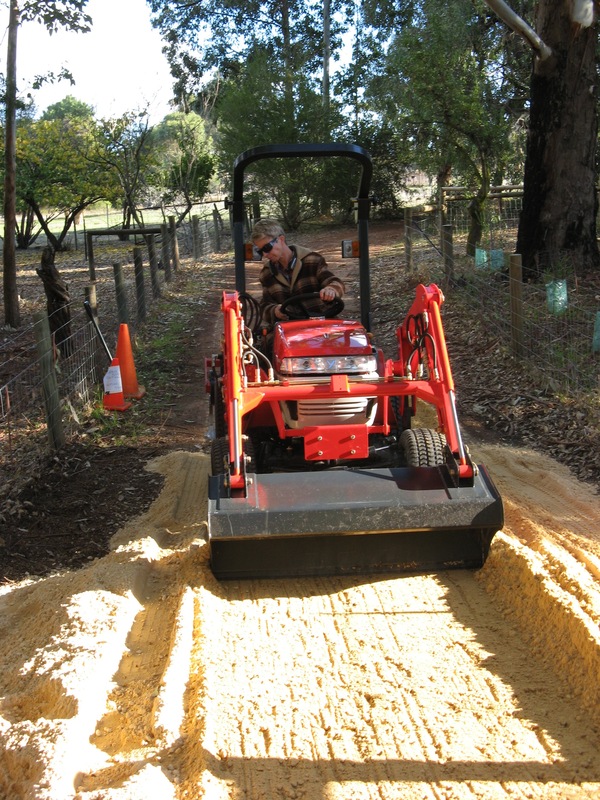 Our other implements are … a ‘Carry-all’, with a trailer ball; a rake ( for clearing twigs etc) and for going over ploughed ground and doing firebreaks; a scarifier with tines which we use to turn over ground and also do the firebreaks if the ground is hard; and a slasher/mower for really tough pastures/weeds needing cutting down. Much easier using a tractor. The colour matched the handbag! 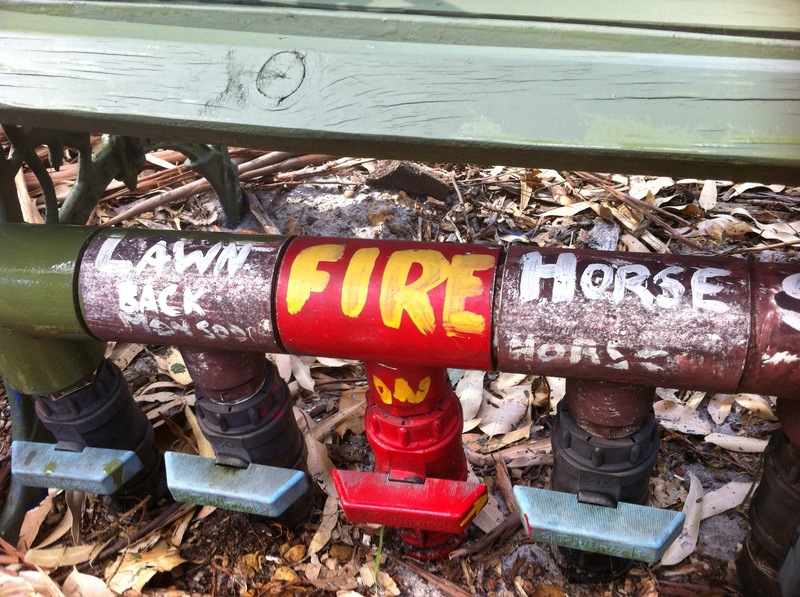 Firebreaks are required to be free of flammable material, so we prefer to water those in the pasture paddocks and near the house to keep them green rather than plough them up. 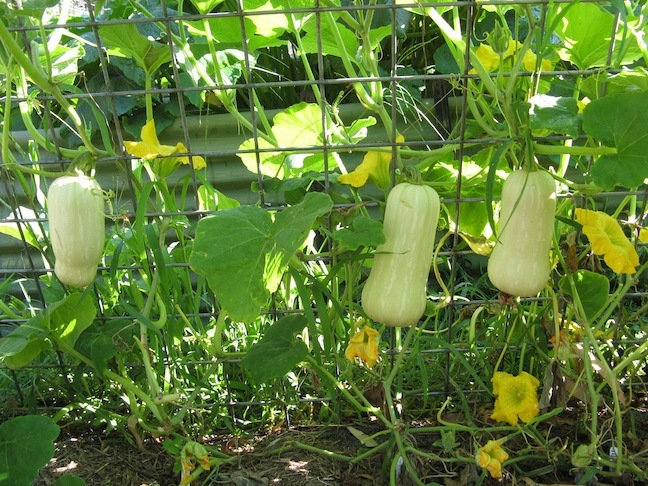 We’ve found the best way to do this is using tractor style sprinklers, either the old ones (these are very sturdy and effective, but difficult to get) or the more modern versions. 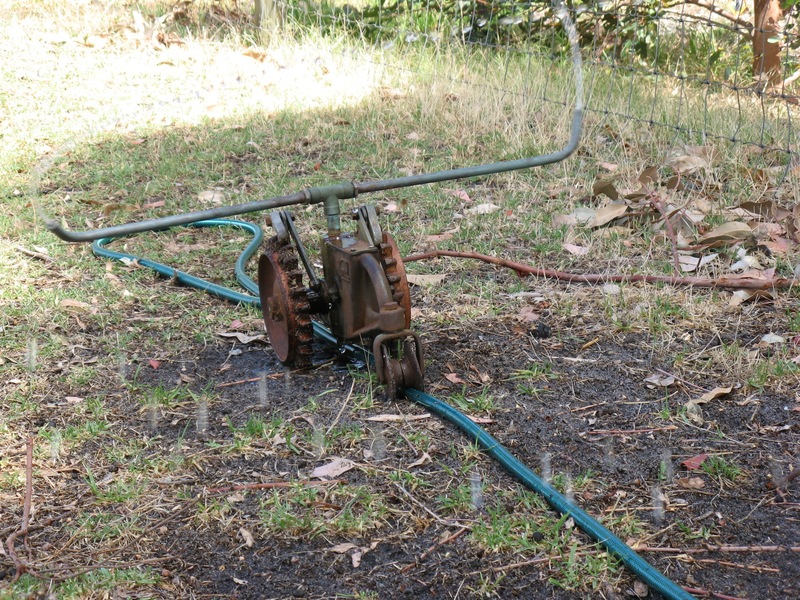 The tractor sprinkler moves slowly along the length of the hose, watering as it goes! 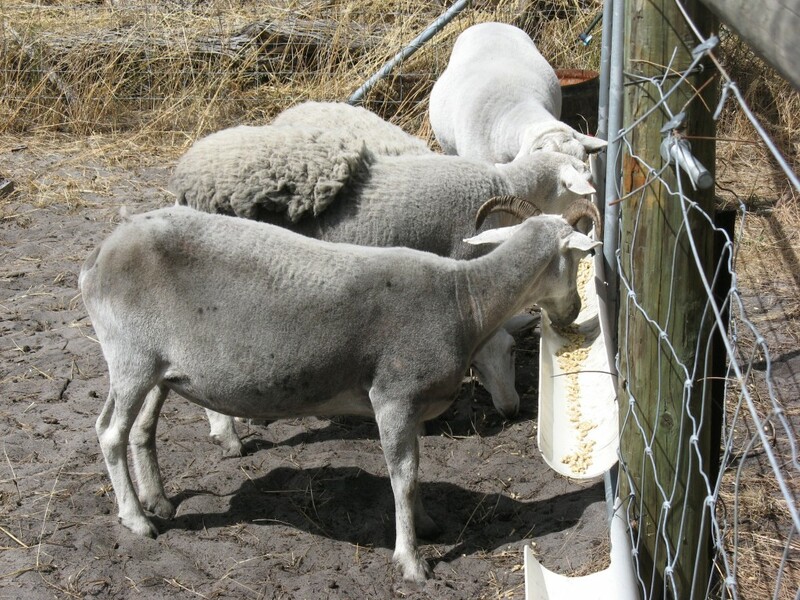 Feeding the sheep, ducks and turkeys- we find using wide diameter water pipe, cut in half length wise makes great animal feeders when attached to a gate or ring lock fence. 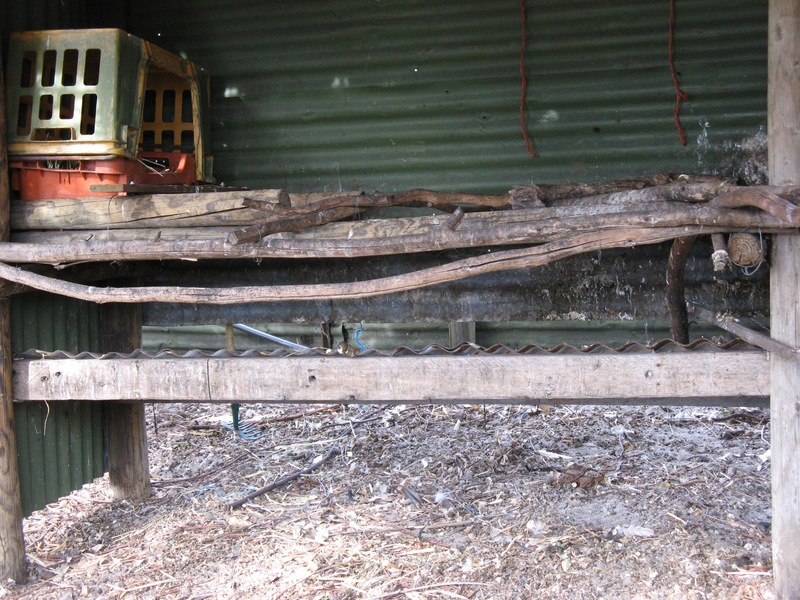 It keeps the food off the ground and a long length enables all the animals to feed at it at the same time. A few holes drilled in allows any water from the rain to drain out. 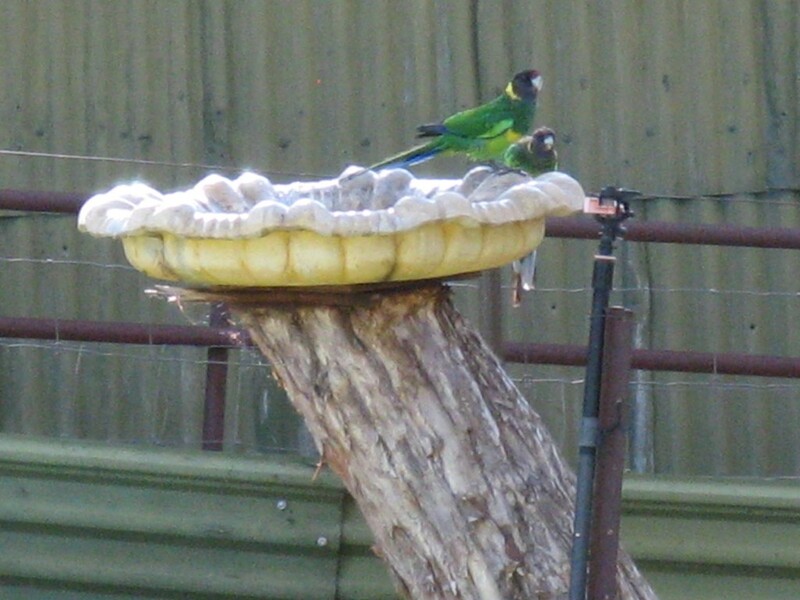 Having a number of birdbaths around the property (within easy access of water) really helps attract the birds and helps them to keep cool in the heat of summer. Training animals to come to your call, for rounding them up for treatment, or returning to their fox proof pens at night: It is worth keeping any new farm animals in their pen/yard for two weeks or so to get used to a routine. Every evening feed them along with all the other animals (even if they have free access to food) and call them (even though they are already there!). They soon get into the routine, and once let out will now return to the pen every evening feed time, even knowing which is their own pen rather than that of another animal! Don’t feed animals at other times, especially during the day otherwise they will see you as a constant source of food and may start ‘mobbing’ you whenever you appear. Small children especially can find a bustling flock of sheep, or a flock of geese or turkeys intimidating and if you only feed them at night they leave you alone during the day. 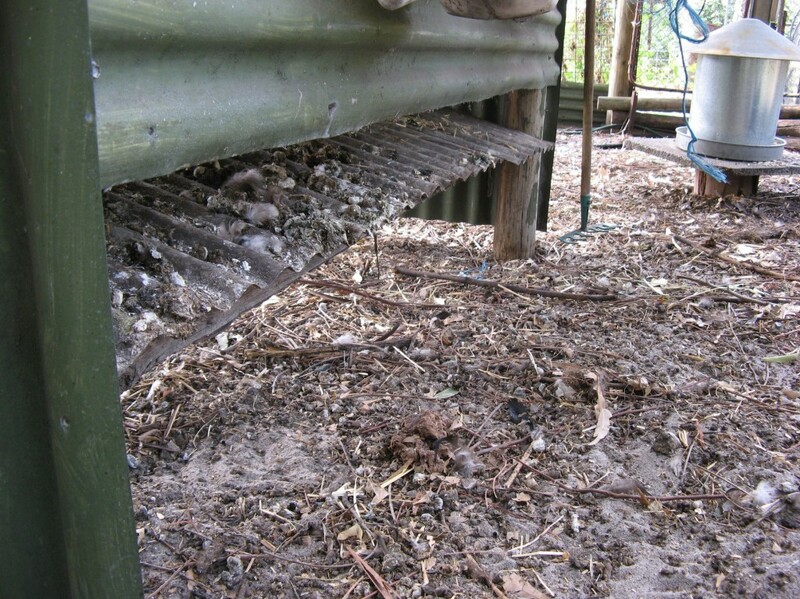 In the poultry house, it is important to have a barrier between the sand ground and their roost to prevent stick-fast fleas. We tried concrete slabs but found they often covered with sand anyway, so now we use a sheet of tin under the roost at an angle that allows the manure to be collected easily for the garden! Use the droppings of other poultry too-there is always a good pile under where they roost, even the guinea fowl who free range. We love having dogs-but have learnt to never take them for granted around the animals! We have trained each of the dogs we have had over the years so they recognise that the animals are ‘mine’ (said when they transgress with a growl and with evil eye fixing the dog’s gaze) and are therefore to be left alone. 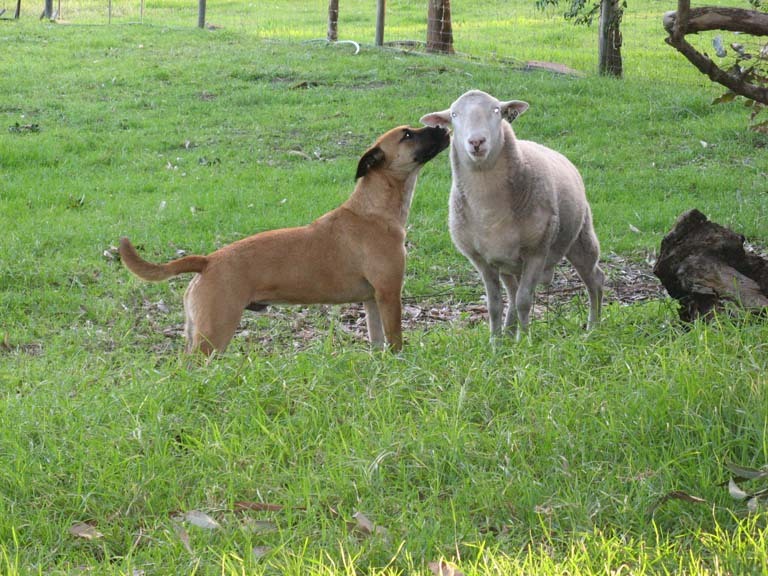 For their part, the farm animals then recognise that the dogs are not a threat, so don’t get all skittish when they are around, and it is a much more peaceful environment for all of them! Having said that, the dogs are never let out into the paddocks unsupervised. 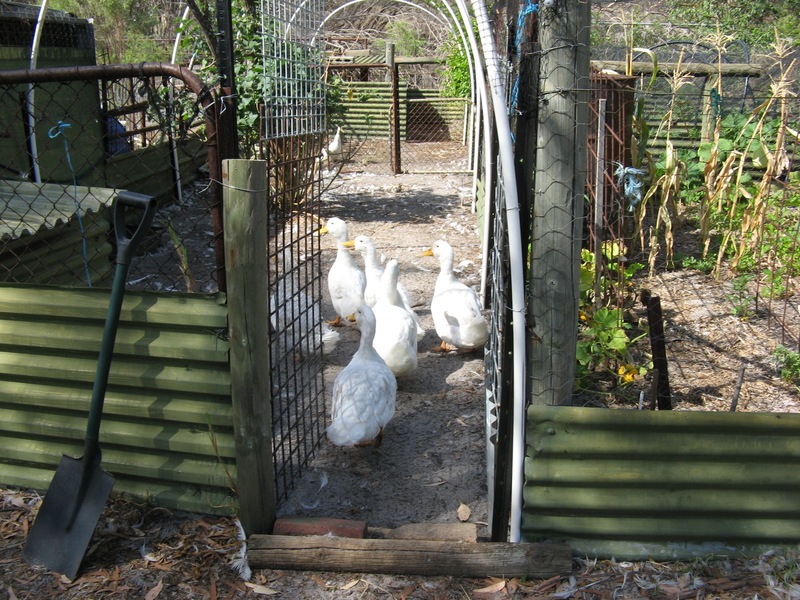 Over the years we have lost a couple of guinea fowl and a sheep to our own dogs when we became complacent or forgot about them while ‘head down’ in the garden or at work fencing. We have found that when left dogs will wander over to the sheep or birds, first ‘mouth’ or lick them (as Finn is doing here with our ram ‘220’) and if they run, instinct takes over and dog reverts to wolf. The dogs love to refresh in a bath too, so troughs low enough for them to cool off on a hot day is a good idea! Cooling off after a run around the paddock! You can’t be precious about your car!! There is always something to carry in it that is usually just above its capacity in weight or size. Hay gets everywhere and poo sticks to the carpet! Seats get filthy from your sweat, blood and work clobber. 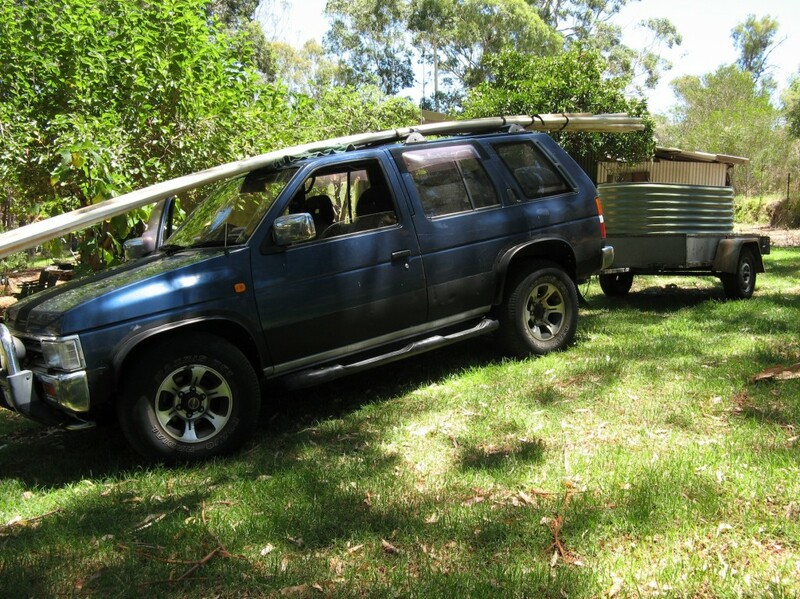 It also then may need to travel down the firebreak to a fence….or through the bush….so it needs to be up to the task and a cheap old reliable 4WD is the car for the farm! Scratches, dirt and ‘dings’ are inevitable, so to avoid being too precious, if it doesn’t have any yet, go out and add a few now—kick it a few times!. To help relieve some of the strain on the car, a trailer is essential. We have one that tips, which is very useful and saves a lot of shovelling or lifting. It also has a removable cage (with a door) that fits inside, which is much better for carting sheep etc than in the back of the car (which we have also done!). We also made a loading and offloading ramp. 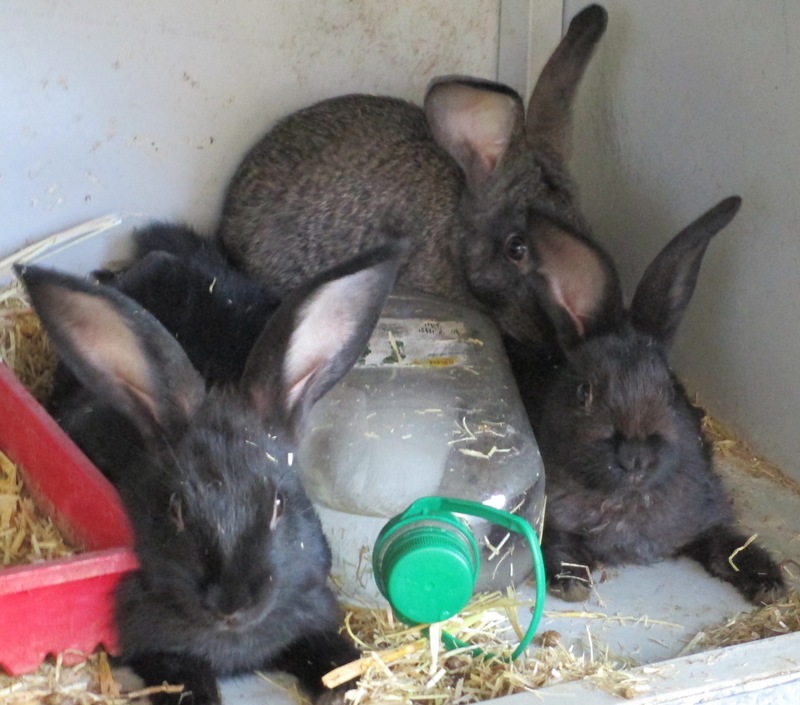 Rabbits in the heat: If you keep rabbits, get some plastic 2 litre juice containers, fill with water, and freeze. On those really hot days (we use them when it is over 36 C) give one to each rabbit. Rabbits don’t like extreme heat, so will lie down alongside or even over the frozen bottles to cool off. 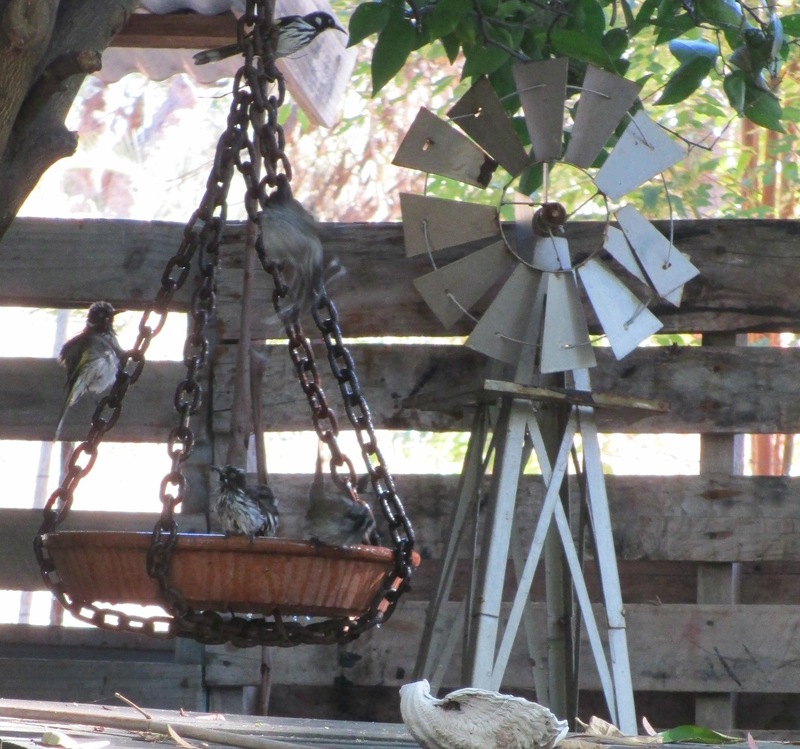 We also have an old oscillating fan in their ‘house’ in summer and a large terracotta saucer with fresh water (as well as their drinking water bottles). They love to lap up the water and even get themselves wet. Ours have a radio on during the day too! Cooling down on a hot day! Watch where your rabbits poo. When they are using one spot so much it begins to accumulate, put some of the poo into a large tray at the very same spot and they will start using it as their private ‘loo’. 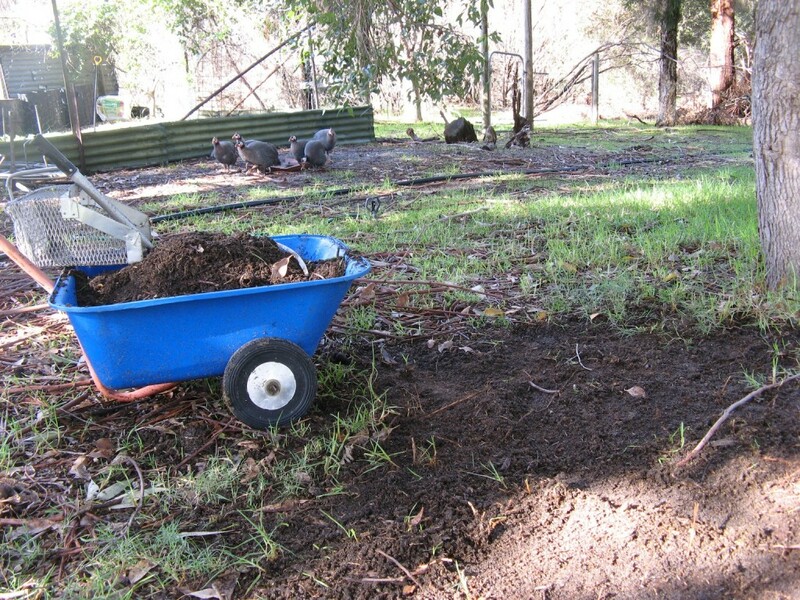 At regular pen clean ups the tray is emptied along with the straw and left over food and sent off to one of the ‘fallow’ veggie gardens, around a tree in the orchard, or in the compost. 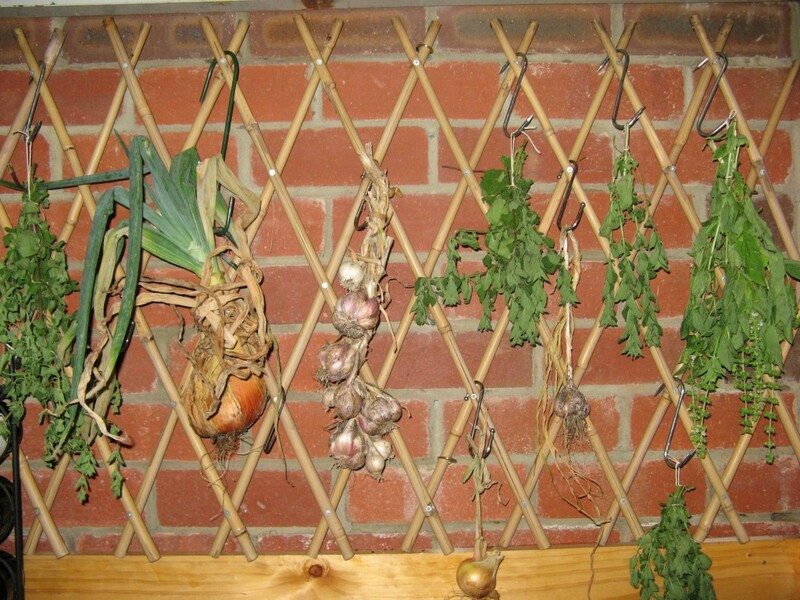 An expandable lattice/trellis is ideal for hanging herbs, onions etc to dry. There is always so much to remember!! And naturally, we forget! 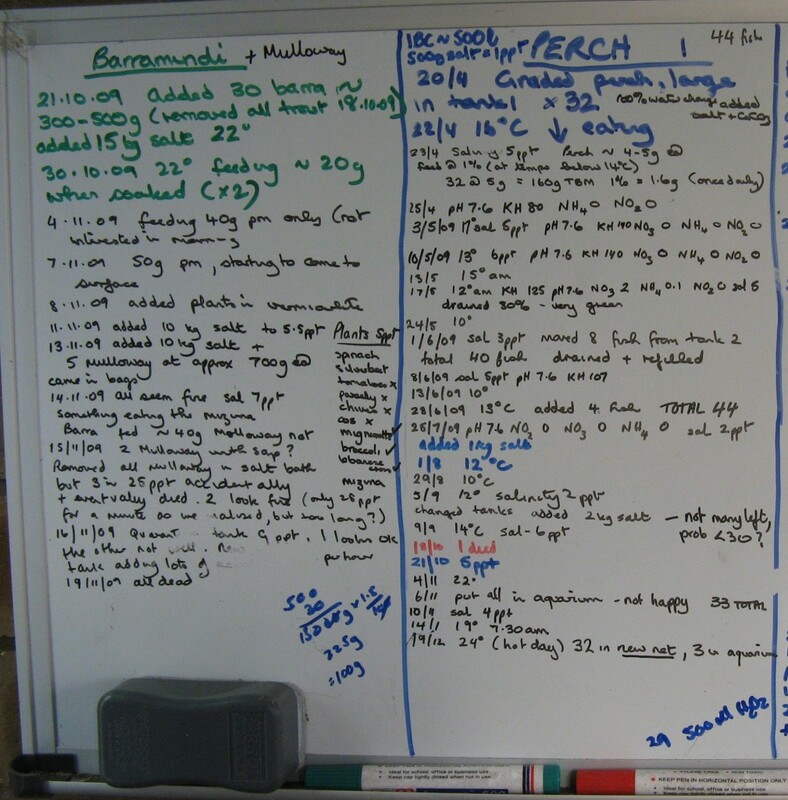 A white board and or planner nearby makes monitoring so much easier. 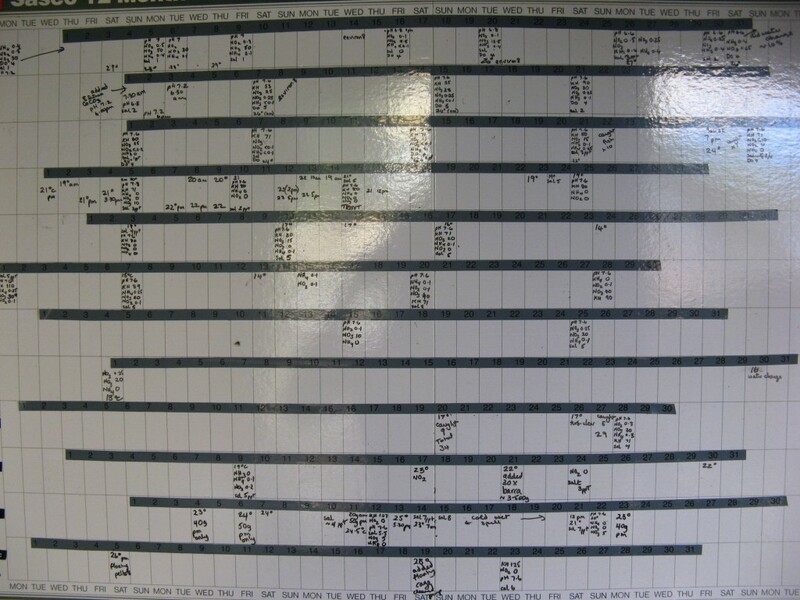 We have one near the fish to record water quality, feeding ratios etc; one near the back door to record sheep and poultry births and deaths; and one in the Flop(sies) House to record rabbit births, weaning dates etc. 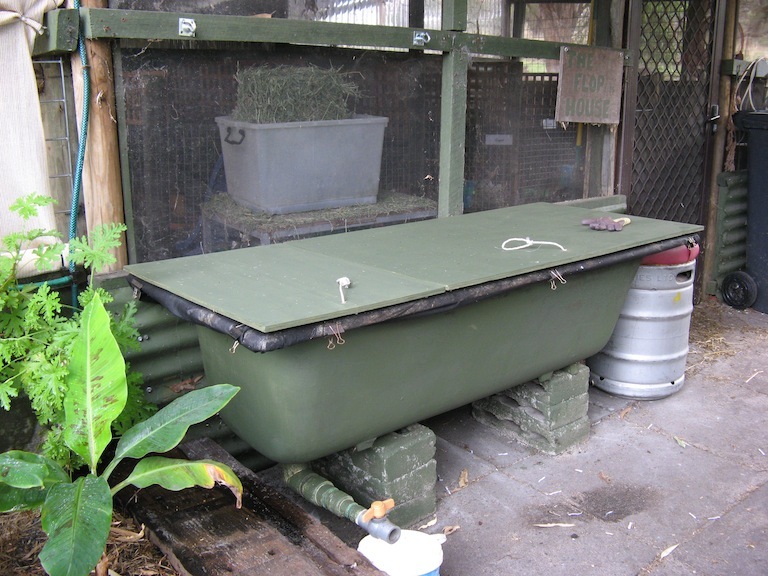 An old bath makes a great worm farm and is really easy to put together! 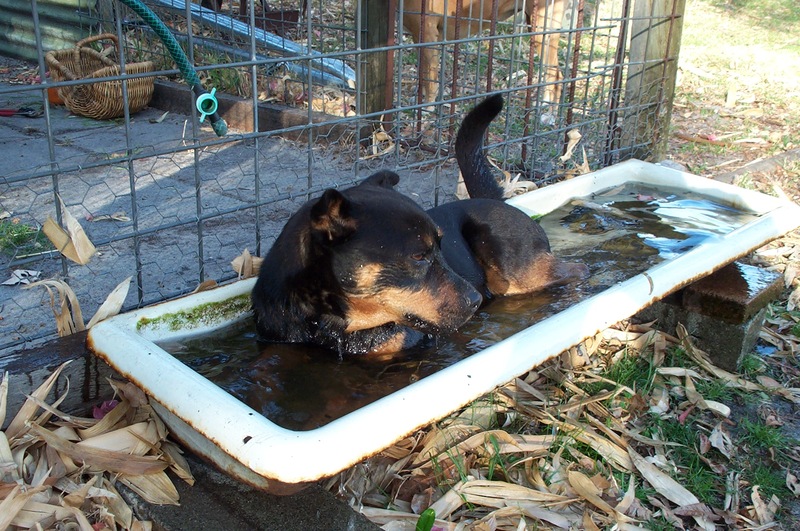 An old cast iron bath, with plywood lid. 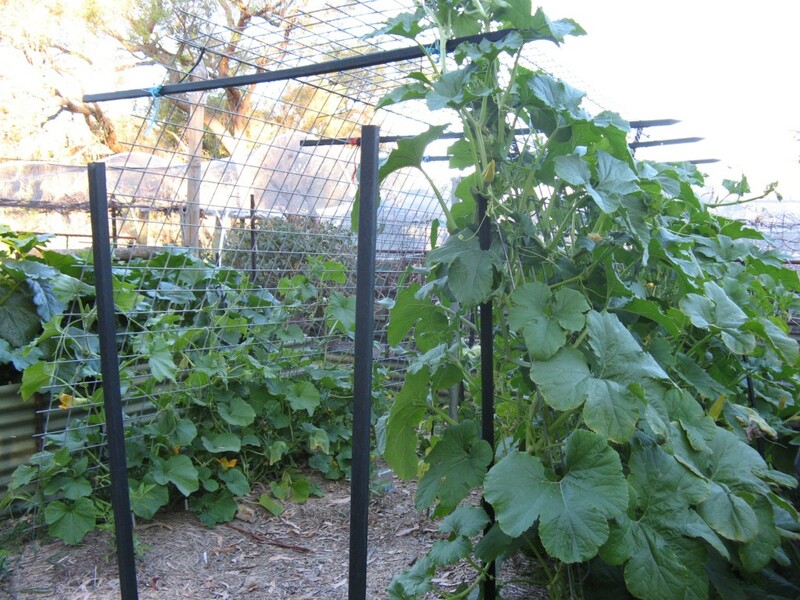 Constructing a ‘pumpkin palace’ out of posts and weldmesh means pumpkin, cucumbers etc can grow up rather than on the ground- saves space and reduces the risk of a snake hiding in there! 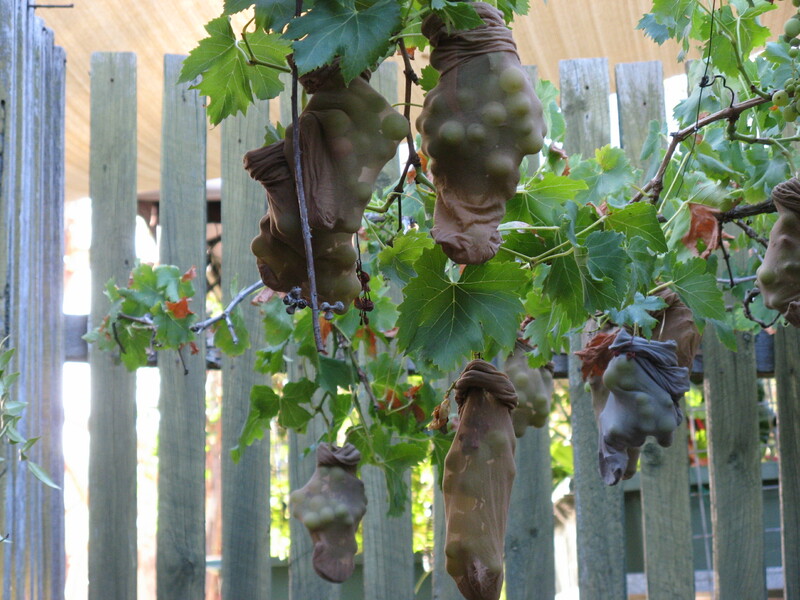 Protect grapes and other fruit from the birds with knee-high stockings. It is a cheap and simple method! Saving some of the grapes for us! Because of all the trees and bush around us and the risk of fire, we have sprinklers on the roof of the house and roof of the rabbit house. The tap for this is painted bright red so it is easy to distinguish it from the others!